Rather than dwell too long on the bridge, turn right and descend into the Pescaria and Erberie, the fish and vegetable markets. If you've only got one day to see this jewel of the Adriatic, there are a few ground rules that you need to obey. Firstly, be selective in what you want to see. Don't try to cover everything. Venice is such a treasure trove that it would be impossible to do it justice in just a day. Secondly, get started early and head to the principal sites before the huge crowds descend on them and make life unbearable. Thirdly, don't try and walk everywhere. It will be exhausting, especially in August when the temperatures are at their highest. Invest in a day pass on the vaporetti (water buses) and use the traghetti (gondola ferries) whenever possible--they cost only 50 cents. Lastly, combine visits to key sites with places off the beaten track where you can catch your breath and relax. There are many hidden campos just a stone's throw from the major tourist spots. 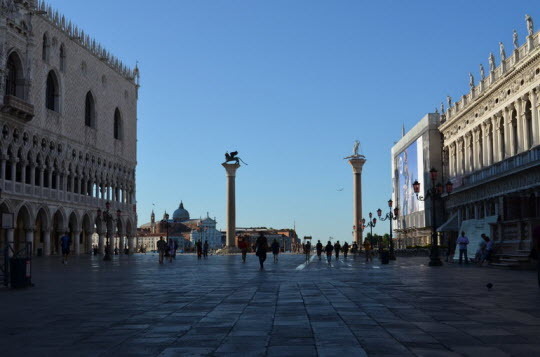 A good starting point is Piazza San Marco (St. Mark's Square) where you will have the chance to indulge in its splendor before the crowds converge on it around mid-morning. Napoleon called this place the 'Finest dining room of Europe' and the view from the Piazza certainly bears this out. Feast your eyes on the magnificence of the 900-year old Basilica di San Marco with its five beautiful ornate domes that evoke the merging of Romanesque and Byzantine architecture. Originally built to house the body of St. Mark, rescued from Alexandria by Venetian traders, it became the chapel for the ruling Doges in their beautiful palace next door. If you look up towards the balcony, you will see four horses above the central doorway. They are copies of the originals which were plundered from Constantinople in the disastrous 4th Crusade in 1204 when the Crusaders rampaged around the Mediterranean coast without ever reaching the Holy Land. If you have time, visit the Basilica just to admire the magnificent, glittering ceilings festooned with paintings of the Apostles. Be careful, however, with the undulating floor--a stark reminder of the constant threat from floods. 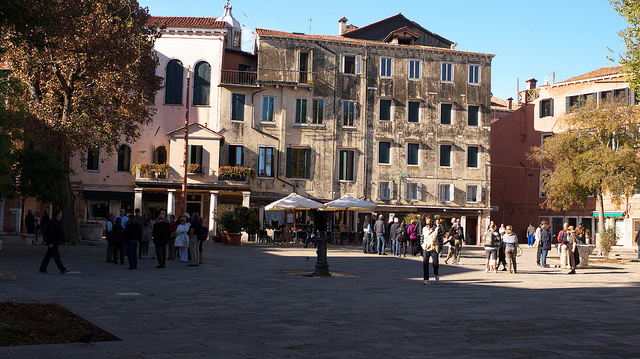 On the left of the piazza is the Torre dell'Orologio (Moor's Clock Tower) with its distinctive clock face and two moors standing on top and hammering the large bell on the hour. To the right is the Campanile, towering over the piazza and offering a panoramic view over Venice if you take the one minute lift ride to the top. Originally built in AD 900 and reaching the height of 324 feet, it collapsed suddenly in 1902 with the only casualty being the church cat. An identical replica was built in 1912 and intensive efforts are underway to stabilize it. Moving through the Piazza San Marco and its two granite columns signifying the gateway to Venice is the magnificent Doge's Palace (Palazzo Ducale). Nicknamed "the wedding cake", it is difficult not to appreciate the beauty of this building, dominating the waterway with its wonderfully ornate arcades and its façade covered in pink Verona marble and Istrian limestone. Do not be deceived by its beauty, however. This was the seat of the Republic's power until 1797 and the delicate exterior masked a world of political intrigue, rapaciousness and ruthless ambition. Those who fell foul of the system soon found themselves making the short walk across the Ponte dei Sospiri (Bridge of Sighs) from the interrogation rooms to the prison and the dark, damp dungeons below. If you carry on along the waterfront past San Zaccaria on the Riva degli Schiavoni, you eventually arrive at a bridge leading to the Arsenale, the symbol of the Venetian Republic's military strength from the 12th to 16th century. At its zenith, over 16,000 arsenalotti worked here, turning out fully fitted and armed galleys in under 24 hours. Although you can't enter this military complex, the short walk is worthwhile just to see the wonderful triumphal arch at the entrance, the Porta Magna, flanked by four marble lions. The café in the square outside is good place to take a breather and a coffee. 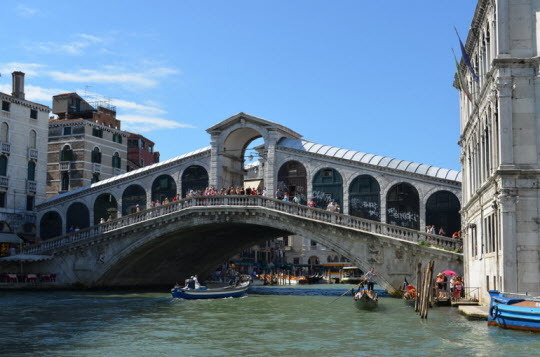 From here, take the vaporetto to Ponte di Rialto (Rialto Bridge) along the Grand Canal and see the most important bridge in Venice built, interestingly enough, by Antonio da Ponte in 1591. It is the simplicity of the design, the construction material--Istrian stone--and its 24-metre span that make this one of the most iconic sights in Venice. Rather than dwell too long on the bridge, turn right and descend into the Pescaria and Erberie, the fish and vegetable markets. The former is housed in an arcaded loggia and is filled with stalls selling every type of seafood imaginable including octopus, mussels, swordfish and sea bass as well as sea turtles, eels and crabs. The vegetable market is in the Campo della Pescaria next to the Grand Canal and bustles with locals and chefs shopping for every variety of fresh fruit and vegetables. Make sure, however, that you arrive before 12.00, when the market closes for the day. Sample the gondola and take the traghetto, next to the market, across the Grand Canal for the sum of 50 cents and head off to the Cannaregio district in the North East and the church of Madonna dell'Orto near the Canale delle Fondamenta Nove. Weave your way through alleyways, across bridges and savor the peace and tranquility of this area, much less frequented by the crowds. This was Tintoretto's (1518-1594) local church and he spent much of his working life here leaving a legacy of masterpieces including The Last Judgement, The Apparition of the Cross of St. Peter and The Martyrdom of St. Paul. He is buried near the altar and his home is nearby in the Fondamenta dei Mori. Moving south across Fondamenta Misericordia, you come to the Il Ghetto (The Ghetto). Built in the 16th century as a refuge for Jews from all over Europe, it was subjected to draconian measures by the Senate. The population was herded into a narrow strip of land with the gates locked and guarded each night and the residents were forced to pay the wages of the guards. In the Second World War, all the residents were deported to concentration camps and only 8 survived. Today only a small number of Jewish residents live in Venice. The Ghetto contrasts sharply with the opulence and splendor of the rest of Venice and is dominated by narrow alleyways, significantly taller buildings due to demographic pressures and a somewhat stark environment. In the Campo Ghetto Nuovo, 7 bas sculptures hang on the stone walls with a barbed wire fence above depicting the holocaust. On the opposite side of the square is a small but interesting museum, Museo Communita Ebraic. From here, take the bridge at Ponte de Guglie and head towards Ferrovia, the main railway station at Santa Lucia. Having been on the move for most of the day, take the strain off your feet and relax on the vaporetto down the Grand Canal back to San Marco. A 20-minute journey will take you the 4 kilometers down Venice's most important thoroughfare past beautiful hotels, museums and some 200 palazzi built between the 12th and 18th centuries, including the Ca d'Oro (The Golden House). At the end, just opposite San Marco is the dominating church of Santa Maria della Salute (The Church of St. Mary of Good Health) often referred to as La Salute and built as a token of thanks in 1630 at the end of one of Venice's terrible plagues that claimed the lives of 80,000 Venetians. Planning a trip? 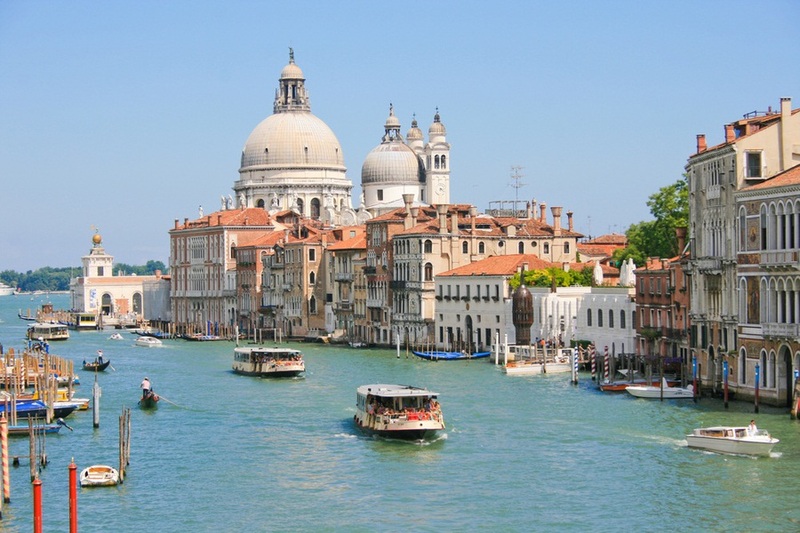 Browse Viator's Venice tours and things to do, Venice attractions, and Venice travel recommendations, or book a private tour guide in Venice for a customized tour!